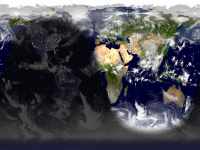 This is a selection of desktop-sized high-quality PNG images, combining near-real-time cloud data, and some very nicely rendered maps using satellite data, to create a nifty, nearly-live world map desktop background wallpaper. Feel free to use those image links to download the images, up to once every hour. The output images are distributed via the Coral CDN. The cloud data no longer 'wraps' at the top and bottom of the map; instead, the script now crops out the north and sound polar regions to remove that little ugliness. See this Wiki for tips on how to display the images on your desktop automatically, without having to manually download them. Comments? Requests? Leave them on the Wiki!